Definition at line 63 of file mbctype.h. Definition at line 52 of file mbctype.h. Definition at line 53 of file mbctype.h. Definition at line 67 of file mbctype.h. Definition at line 68 of file mbctype.h. Definition at line 66 of file mbctype.h. Definition at line 65 of file mbctype.h. Definition at line 61 of file mbctype.h. Definition at line 59 of file mbctype.h. Definition at line 58 of file mbctype.h. Definition at line 60 of file mbctype.h. Definition at line 36 of file mbctype.h. This file has no copyright assigned and is placed in the Public Domain. This file is part of the w64 mingw-runtime package. No warranty is given; refer to the file DISCLAIMER within this package. Definition at line 28 of file mbctype.h. Definition at line 71 of file mbctype.h. Definition at line 220 of file mbctype.h. Definition at line 51 of file mbctype.h. Definition at line 50 of file mbctype.h. Definition at line 56 of file mbctype.h. Definition at line 55 of file mbctype.h. Definition at line 1472 of file locale.c. Referenced by test__mbscat_s(), test_ismbckata(), test_ismbclegal(), test_mbbtombc(), test_mbcjisjms(), test_mbcjmsjis(), test_mbcp(), test_mbctohira(), test_mbctokata(), test_mbctombb(), and test_splitpath(). Referenced by _ismbbgraph(), _ismbbprint(), and _ismbcprint(). Referenced by _ismbclegal(), _mbclen2(), _mbsbtype(), and test_mbcp(). 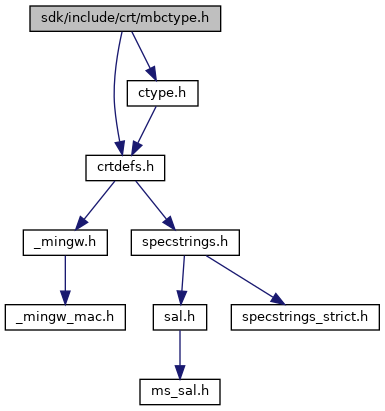 Referenced by _ismbstrail(), and test_mbcp().